Waterville, Ireland – Waterville Golf Links in County Kerry, Ireland is finalizing phase two of an extensive clubhouse, golf shop and dining area renovation that started in 2017. “There are a lot of exciting developments in the town of Waterville. With Waterville House and Golf Links and the addition of the new Hogs Head Golf Club and Lodge, Waterville, Ireland is becoming a world-class golf destination. At Waterville Golf Links we are completing the master clubhouse restoration which includes new locker rooms, golf shop, bar and dining facility. On the links, we are continually investing in sand and fescue seed, with the goal of enhancing the purity and firmness of the links turf to produce the finest true links playing conditions” said Links Superintendent Michael Murphy. 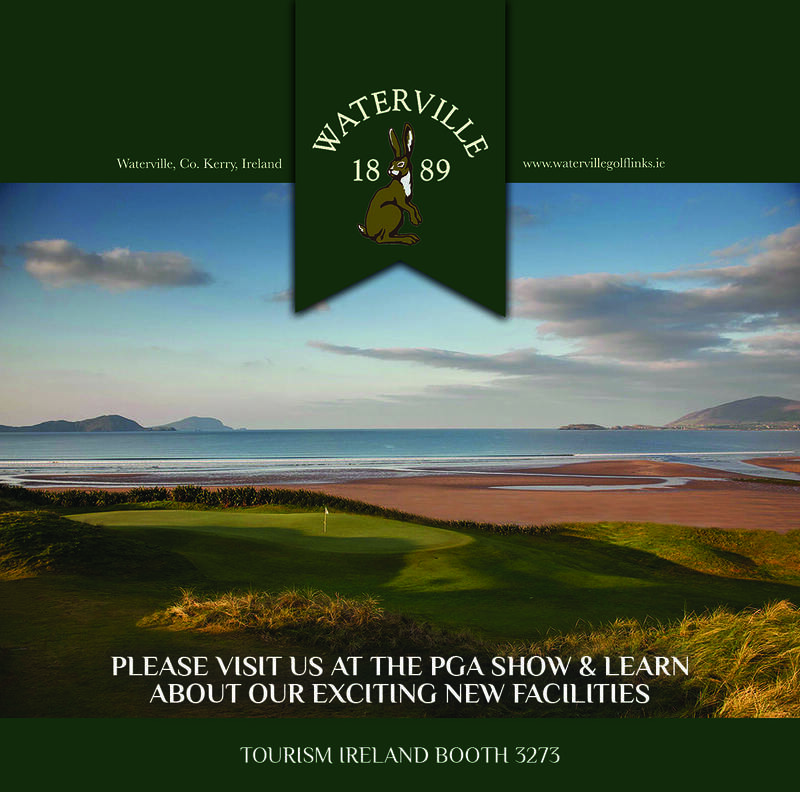 The team from Waterville Golf Links will be attending the PGA Show in Orlando at the Tourism Ireland (booth 3273) and highlighting the new facilities and exciting renovations. The new facilities will play host to a 2019 season of events including; two member-guest only events, the Summer Solstice June and the September Member Guest Tournaments, the Kerry Cup, and two signature Carr Golf events; the 12th World Invitational Father & Daughter, the 30th World Invitational Father & Son. These events bring golf families and friends from all over the world to Waterville Links to experience true links golf in a setting like no other. The history, quality golf and comradery keep these golfers coming back year after year. Waterville Golf Links is one of the world’s most coveted links golf courses set on the magnificent South West Coast of Ireland in Co. Kerry. Waterville Golf Links now showcases the vision of noted international golf architect, Tom Fazio who was commissioned to update the memorable Eddie Hackett masterpiece. Fazio has assisted many of the world’s leading clubs including Winged Foot, Pine Valley and Augusta National. Over 125 years old, Waterville Golf Links is currently positioned at No.2 in the Golf Channel’s Top Courses in Ireland and ranked No.3 in Ireland by Golf World UK. The magnificent 18th century Waterville House is an elegant period Irish Manor House set on the Wild Atlantic Way amidst the natural beauty of a forty-acre estate overlooking the Atlantic Ocean. Waterville House has 13 bedrooms en suite, sauna, steam room, health facility with massage room, billiard room and private golf practice facility. Guests of Waterville House enjoy preferential tee times and access to fishing in private lakes and rivers including Lough Currane. Waterville House provides the most famous sea trout and salmon fishery in Ireland. A Fazio designed practice facility was in recent years added to the Waterville House Estate grounds and a state-of-the-art health facility was added for the enjoyment of residents. All these projects have firmly positioned Waterville’s reputation one of Ireland’s premier links golf destinations. Waterville House and Waterville Golf Links have received numerous awards and has been recognized for its outstanding achievements including: Best Golf Course of the Year Award, Golf Manager of the Year Award, Best Golf Shop and Boutique Hotel of the Year. For assitance with adding Waterville to your next Ireland Golf Trip contact SWING.